As part of any new installation work or a re-wire, a cable, trunking or cable tray sometimes has to pass through an element of building construction, such as a ﬂoor, wall or beam, necessitating the formation of a notch or opening in the element. To comply with Regulation 522.8.14, no wiring system should penetrate an element of construction that is intended to be load bearing unless the load bearing ability of the element remains satisfactory after such penetration. For reasons of structural integrity, there may be restrictions on the dimensions or location of a notch or opening that may be formed in a load bearing element of construction. In some cases the formation of a notch or opening may be completely unacceptable. Where necessary, the advice of a suitably competent person should be obtained. When working on domestic property electrical contractors are likely to encounter a variety of types of ﬂoor and ceiling joists. These may range from traditional solid timber joists to manufactured joists with timber or metal webs. 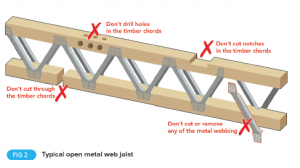 Some pre-formed joists employ solid timber webs and when it is necessary to drill through this type of web it is most important to either follow the manufacturer’s instructions or to take advice from a suitably qualiﬁed structural engineer. 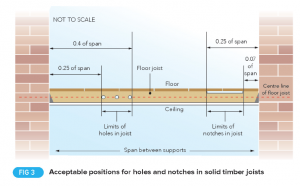 Typical manufacturer’s details for drilling I-Joists are shown in Fig 1. Do not notch or drill holes through the top or bottom ﬂange. It is generally permissible to drill up to 38mm holes anywhere in the web. Typically, most manufacturers have little perforated knockout holes that can be punched out without the use of a drill. Where the property contains metal web joists as shown in Fig 2, no notching, drilling or cutting in either the timber ﬂanges or the steel webs is permitted. These types of joists are engineered and their structural performance relies upon their integrity not being compromised. Approved Document A no longer provides guidance on the drilling of solid timber joists, instead guidance is provided by BS EN 1995-1: 2004 (as amended). The Timber Research and Development Association (www.trada.co.uk) is a useful source of information regarding the drilling and notching of timber structural elements. 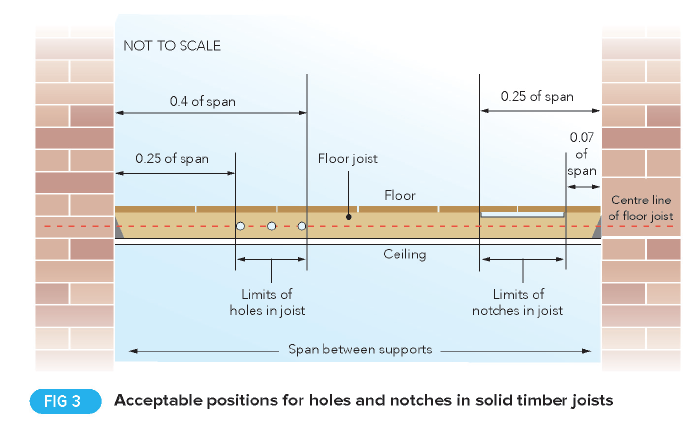 It is generally accepted, within the construction industry, that when dealing with simply supported1, solid timber joists not greater than 250 mm in depth, adherence to the following guidance means that the eﬀect of notches and holes need not be calculated (see Fig 3). not be cut closer to the support than 0.07 of the span, nor further away than 0.25 times the span. Not less than 3 diameters (centre-tocentre) apart; and located between 0.25 and 0.4 times the span from the support. It should be noted that notches or holes should not be cut in roof rafters, other than at supports where the rafter may be birdsmouth3 to a depth not exceeding 0.33 times the rafter depth. Cutting a hole or a notch other than in speciﬁed areas can lead to a joist being weakened to such a degree that collapse might occur, even where the loading is below the maximum expected value, especially if made in the middle of a span as shown in Fig 3. At some stage of the electrical installation, there will need to be chases made in the walls of the building as shown in Fig 4. 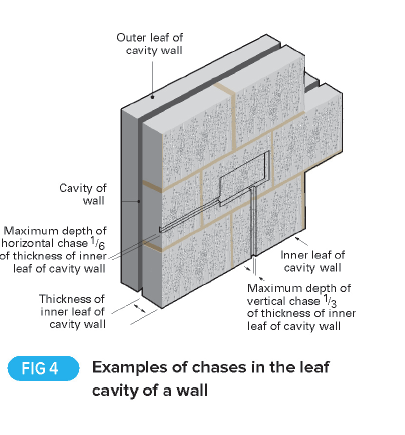 – Vertical chases should not be deeper than ⅓ of the wall thickness or, in cavity walls, ⅓ of the thickness of the leaf. – Horizontal chases should not be deeper than ¹/6 of the thickness of the wall or leaf. Chases should not be so positioned as to impair the stability of the wall, particularly where hollow blocks are used.